The Lakes National Park is a peaceful bushland retreat in the Gippsland Lakes, fringed by the waters of Lake Victoria and Lake Reeve. The park occupies 2,390 hectares of low-lying woodland and coastal heath, consisting of Sperm Whale Head peninsula, Rotamah and Little Rotamah Islands. Call into the park office in Loch Sport during office hours and view the information displays, exhibits and 'touch table'. The most popular of several picnic areas is at Point Wilson, the site of the original settlers' homestead. Camping is permitted at Emu Bight only, close to the shore of Lake Victoria. A network of walking tracks exists and the gently undulating tracks are suitable for family outings. The self guided Lake Reeve Nature Trail, featuring the Lookout Tower, is a popular short walk through several habitats with many points of interest along the way. Situated at the beginning of the Nature Trail, the Lookout Tower affords magnificent views of Lake Reeve and the Gippsland Lakes system. Many bird species can be observed throughout the park or, alternatively, from bird hides situated at Lake Killarney and on Rotamah Island. Rotamah Island is a naturalists' bushland delight, surrounded by Lake Victoria and Lake Reeve to the north and the dunes of the Ninety Mile Beach to the south. Rotamah Island along with Little Rotamah Island and Sperm Whale Head comprise The Lakes National Park. Rotamah Island is accessible by boat via Paynesville (six kilometres) or Loch Sport (18 kilometres). Rotamah Island had a number of occupants until 1975 when it was bought by the Victorian Government. In 1978 Rotamah and Little Rotamah Islands were added to The Lakes National Park. In late 1979 the Royal Australasian Ornithologists Union, now called Birds Australia, began leasing the island's homestead to operate as a bird observatory. Currently the observatory is involved in various research programs as well as regularly running weekend natural history courses. Rotamah Island supports eucalypt and banksia woodland on its sandy soils. Much of the island is open woodland, a reminder of the grazing that occurred. The lower lying areas contain dense stands of melaleuca. The island supports populations of Eastern Grey Kangaroos, Swamp Wallabies, possums, echidnas, wombats, reptiles and bats. Rotamah Island is also renowned for its prolific bird life and more than 190 bird species have been recorded. Commonly sighted birds include Emus, grebes, cormorants, pelicans, rosellas, robins and the graceful White-bellied Sea Eagle. The picnic area at Point Wilson has barbecues, a day shelter, toilets, water and a jetty. The camping area at Emu Bight has a communal shelter, fireplaces, toilets and water. 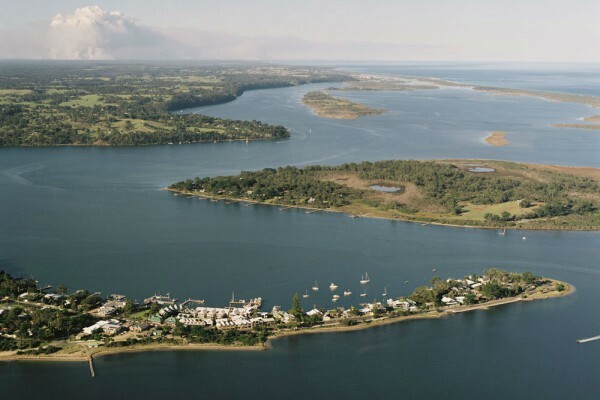 The Gippsland Lakes area was once part of a large bay. Over many thousands of years sands deposited by the sea have formed a series of barriers including the Sperm Whale Head Peninsula, Little Rotamah Island and Rotamah Island. The outer barrier eventually enclosed the bay and formed the Ninety Mile Beach. These barriers are up to 38 metres high and enclose the waters that make the Gippsland Lakes. Aborigines of the Kurnai nation were numerous in the area at the time of European arrival as can be seen by the many shell middens in the sand dunes along the Ninety Mile Beach. The abundant wildlife and mild climate of the Gippsland Lakes provided plenty of food making it an ideal area to inhabit. In the summer of 1840 explorer Angus McMillan reached the shores of Lake Victoria and soon after cattle runs were taken up in the district. During this period much of the area now covered by park was cleared and cultivated for grazing. Through the efforts of Mr F.W.C Barton and the Field Naturalists Club of Victoria, 1,451 hectares on the Sperm Whale Head peninsula was reserved in 1927 for the purposes of a national park and proclaimed The Lakes National Park in 1956. Rotamah Island and Little Rotamah Island were added to the park in 1978. Natural bushland has since regenerated and much of the wildlife has returned to the area. More than 190 species of birds have been recorded in the park including the rare White Bellied Sea Eagle and the endangered Little Tern. The park also supports a large population of Eastern Grey Kangaroos and Black Wallabies. Brush-tailed Possums and Ring-tailed Possums are also common. Less common mammals include Sugar Gliders, Pygmy Possums and the endangered New Holland Mouse. The rare Large-footed Myotis is one of eleven bat species also found within the park. Eucalypt and banksia woodland are widespread on the sandy soils throughout the park. Areas of coastal heath are interspersed with swampy, low-lying areas that support salt marsh vegetation. From August to November, the park is at its best with a spectacular show of wildflowers and one of the best displays of native orchids in Australia. Several rare plant species occur including Ribbed Thryptomene (Thryptomene micrantha) which, apart from this area, is found only in Tasmania and the York and Eyre Peninsulas in South Australia. Fires may only be lit in the fireplaces provided and not at all on days of Total Fire Ban. Fires must be completely extinguished with water before leaving and are not permitted on the Ninety Mile Beach. Dogs, cats, generators and firearms are not permitted. All native plants and animals in the park are protected by law. Many kangaroos and birds frequent the picnic areas but please do not feed them because our processed foods are not part of their normal diet. The Lakes National Park is in East Gippsland about 300 km east of Melbourne. The park is located at the eastern end of the township of Loch Sport, 63 km east of Sale. Boat access is possible from Paynesville (5 km).